It's been a little over a year since we got our hands on Lightroom 4 and now Adobe is fast at work on the new version called Lightroom 5.
ou can grab the free download here and use it for a few months until it expires. Photography is about capturing the moment. However, those moments can be improved later. Shooting in RAW format in your camera allows you almost limitless improvements using Adobe Lightroom, now on version 4. At first, this software may appear to be intimidating. It's designed for serious amateur and professional photographers, after all. (If all you want to do is crop or fix red eye, it's probably more than you need.) It also integrates with PhotoShop for even more complicated editing. If I'm not processing an HDR set of photos I'm likely using Trey Ratcliff's great Lightroom presets or some of my own. 1. Learn how to import your photos. Lightroom works on a database and workflow system - you have to import the photos before you can do anything with them. They're imported into the Lightroom Catalog, which will be the first thing you see when you open the program. On the left side of the bottom is an import button. You can either set a destination folder or just click "Add" to bring in all your photos in the folders they're already in. Make sure to use Copy to get files from a card. 2. If you're in a hurry, just use the Quick Develop function, especially if you're processing an entire batch of images. You can crop or adjust exposure on an entire folder of photos at once - so if all the pictures you took at that sporting event came out too light, you can fix them all, in one go, without worrying about numbers. 3. Use other people's presets. One very important thing newcomers to Lightroom can benefit from is free presets that more experienced users have made available. These allow you to set a ton of effects in just one click - they might not always work, but everything done in Lightroom can easily be redone. Again try Trey's presets, you won't be sorry. In fact I've used some of his presets to develop entire batches of baby photos I've taken. 4. Be careful with your raw files. It's always best to convert to.dng, because Lightroom stores changes in the XMP file, not the image itself. This is fine until you send the photo to somebody else - they may not be able to see your edits. Use the import option to convert your files to.dng. Play around and see what works well for you. Mostly I keep everything in RAW and then I export as a high quality JPEG. So again, there are multiple ways that work. 5. Don't move imported images except by using Lightroom. The temptation to just open the folders and move files around is very high - it's quicker, especially if you don't have the software running. However, if you do this, Lightroom will lose track of your files and not be able to open them. Lightroom is a powerful tool with a great workflow, especially if you happen to take a lot of photos at a time. It can be intimidating, but once you know how to use it, it will save you a lot of time and aggravation. It be an understatement to say that the Flickr app released in late 2012 was an important move for the service. It probably helped save the farm. Now that great app just got another shot of adrenaline with some great upgrades. Picking photos from your iPhoto Photostream to save to Flickr. This is great because not every photo I want to share exists on my phone's camera roll. And often I'll save some heavily edited DSLR shots to my Photostream. This makes that whole process a tad easier. uch faster uploading. I noticed a significant speed bump under the hood. When they first released the app I saw slow upload times. Thanks Yahoo. Snap photos using the iPhone's volume up button. This is a no-brainer and I don't understand why more camera apps don't take advantage of this functionality now that Apple allows access to these buttons in the SDK. Afterall Apple lets you snap pictures this way while using the built in camera app. This update saves an original photo to your camera roll in addition to your heavily post-processed version. Higher resolution photos are now displayed in the lightbox view. And there are a few more bells and whistles like quickly tagging your contacts in photo comments by typing @screename, and now you can get notified when contacts mention you. Now that Flickr is back with a vengeance I'm still struggling to figure out how it fits into my overall photo workflow. But the way I see it no other service offers the same level of high resolution photo sharing that Flickr does. Here are 5 great features in the Photoshop 13.1 for Creative Cloud Folks. 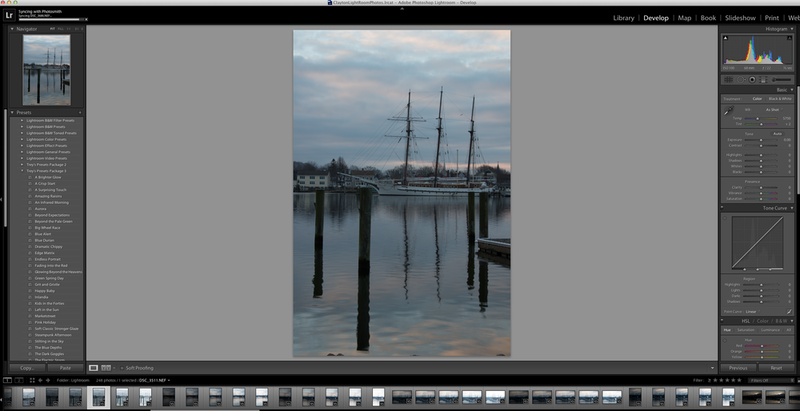 Sometimes I get too bogged down in aperture, shutter speed, and ISO that I forget photography is all about fun. At least for me it is! That's why I decided to start reviewing some fun photo apps and programs that I've been using just to pass the time. I wanted something that my kids and I could play with while I had an iOS device in my hands. Anytime a child can see themselves on the screen they get really excited. That's how I discovered PopBooth for iOS while digging through the App Store. 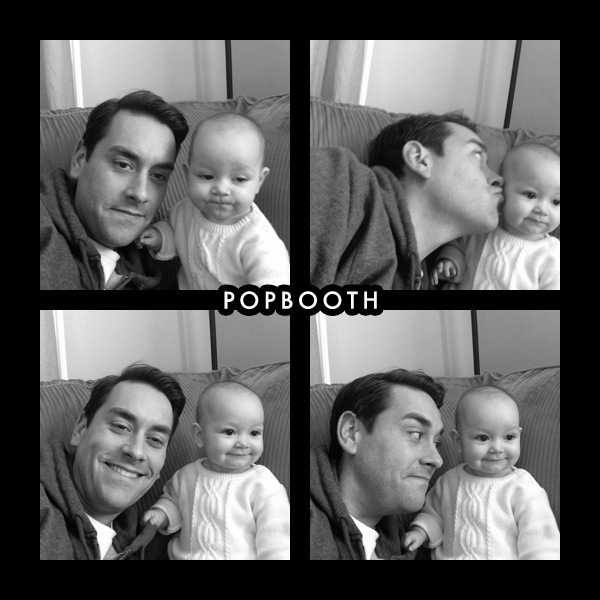 PopBooth lets you use the front facing camera to snap multiple photos in a sequence like you would at one of those old kissing booths at a boardwalk carnival. Not that I would know anything about that of course. The interface is clean and easy to use. Once you tap the camera button you get a countdown clock before it starts snapping a series of four photographs. There's a white bracket safe area to let you know where to align your faces. Once your photos are done you can add a series of filters like black-and-white, vintage, and some funky colors. You can also complete some in app purchases to buy more. 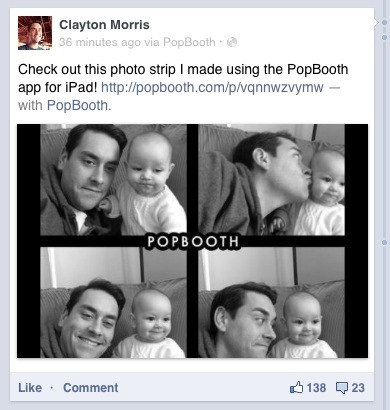 For $1.99 you can send your PopBooth photo as a postcard to a loved one. The sharing features are one of the downsides of this application. I found it a little confusing. It's not immediately obvious that your photos are saving to your camera roll as there is no button that lets you do this. Once I exited the app to check my camera roll I found my photographs were saved there. You have the option to share to Facebook, Twitter or email. If you decline to share to any of those and you hit the share button the photo automatically saves to your camera roll. My other criticism is not being able to edit the comment accompanying your photo when it's shared to the social networks. Once I shared my photo to Facebook it comes complete with a stock comment that I wasn't able to edit. Minor gripes aside I'm really enjoying this application. And so is my daughter! It's free so grab it today in the App Store here. I've recently been in a number of situations where I wanted to look at my just-shot RAW photos but didn't want sit up in my office at a desk all night. I just wanted to sit on the couch with my iPad and have some impact on my overall photography workflow. Enter Photosmith. This is the iOS app I'd been looking for. I look at it as a way to sit on the couch, import a bunch of RAW photos to my iPad and do some Lightroom work without using Lightroom just yet. Don't get me wrong, I like Lightroom, but nothing beats an iPad for being able to hold the photos you took in your hands. Photosmith syncs with Lightroom using a simple plugin, so all the metadata I add to the photos in Photosmith winds up in my permanent Lightroom library. As an example, tonight I took 60 photos of my daughter. I imported the RAW files to my iPad and used Photosmith to create a collection, star the photos I wanted to edit eventually, and added some creative commons metadata. Then I opened Lightroom on my Mac and hit the sync button. Because both my iPad and Mac are on the same network the photos started showing up in my Lightroon library with all the metadata intact. Sweet! I'm planning an amazing trip to New Zealand in the coming months and Photosmith may become an important tool for my return flight. At 30,000 feet it'll be wonderful going through hundreds of photos on an iPad's touchscreen. When I get home I'll be ready to edit and process the photos I've already picked.